Housing advocates have set up a website looking for plaintiffs for a suit against a Bay Area town that refuses to densify its housing supply. In the quest to solve gentrification and displacement, affordable housing advocates in California’s Bay Area have been thinking outside the city box for solutions. Frustrated with San Francisco’s refusal to build new housing and by the lethargic affordable-housing game around the metro, the advocates are looking to the suburbs to increase their housing supply. Right now, eyes are on the East Bay city of Lafayette, population roughly 24,000, where a developer has downsized (or upgraded, depending on your viewpoint) a project that initially included 315 moderately priced apartments to 44 single-family homes that will sell for $1.2 million each on average. It’s the latest outrage for those who’ve been pushing for Bay Area suburbs to ramp up new housing development to help ease housing costs in the city. San Francisco planning director John Rahaim told San Francisco Business Times that smaller communities that refuse to dense up are “contributing to the crisis” of unaffordable housing. And so now, housing advocates plan to sue Lafayette over the de-densified housing project … as soon as they find some plaintiffs. The California Renters Legal Advocacy & Education Fund has launched the website Sue the Suburbs to bring attention to the situation in Lafayette. The site is also set up to find people who could have rented one of the 315 apartments from the original housing plan, had it been approved. If the group can successfully find plaintiffs, this could be the opening salvo for potential legal action against other Bay Area cities to force them to kick in to help house the region’s explosive population growth. Lafayette is a “semi-rural” town looking to stay that way. It actually lost 15 residents between 2000 and 2010. During that period, the number of renter-occupied housing units dropped significantly from 2,128 to 1,186 units. Meanwhile, Lafayette’s white population also dropped, from 86.8 percent to 84.7 percent, while its Latino population rose from 4 percent to 5.8 percent. The black population was mostly static at less than 1 percent over the 10-year period. Trees — The developer would have had to chop down 92 of the 117 trees on the site. The developer proposed planting an additional 700 trees to make up for this, but the city still balked. Traffic — For residents who spoke out against the apartments at public hearings, complaints were mostly about fears of increasing traffic. Meanwhile, there is a BART metro train stop right by the proposed project site. 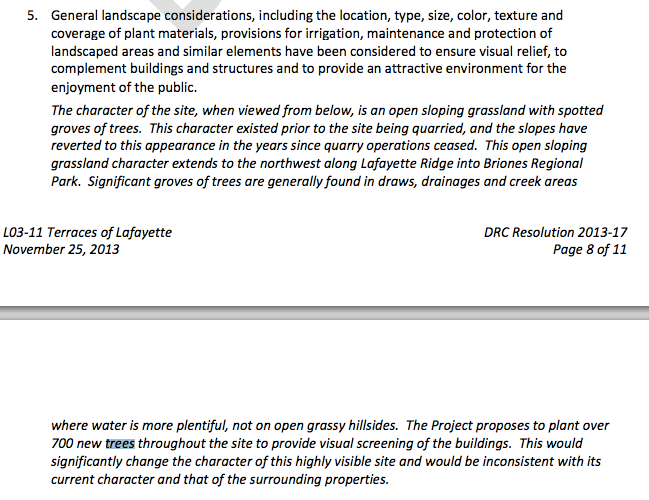 Identity — Here’s how Lafayette explains it: “The proposed project does not respect the natural environment of the site and does not preserve the scenic quality of the ridgeline, hillsides, creek areas, and trees on the site. … The project does not preserve or protect the semi-rural character of the area or help communicate the image of Lafayette as a semi-rural community.” This hillside, by the way, is where “The Crosses of Lafayette” Iraq/Afghanistan war memorial was located for years. 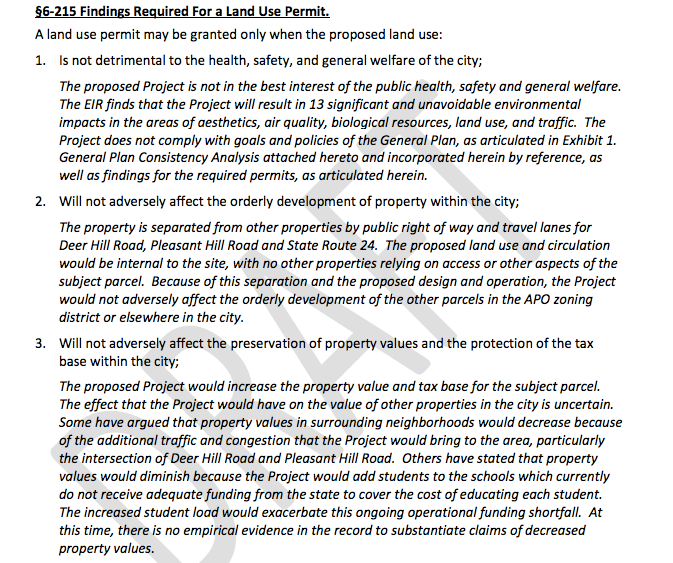 O’Brien Homes tried to work around these issues and even decreased the number of apartments that it planned to build to 209, but the city still refused to bite. What O’Brien is offering now, along with the 44 single-family homes, is a new soccer field (the city’s “highest priority”) and a 2.9 acre dog park. Those amenities will fulfill Lafayette’s needs, but they leave the Bay and San Francisco hanging. The Association of Bay Area Governments set goals for new housing production for each municipality in the region, called the Regional Housing Needs Allocation, to accomodate population growth. Lafayette built just 65 percent of its goal between 2007 and 2014. Actually, none of the Bay Area counties are pulling their weight in the housing plan. Pedro Galvao, regional planner at the Association of Bay Area Governments, says that the bay suburbs are legally bound to comply with the Regional Housing Need Allocation, but there’s a catch. "California Housing Element Law requires jurisdictions to plan for all the housing units they were allocated by income level, including identifying sites where the housing could go and appropriately zoning those sites. However, state law leaves the actual construction of the units to the market, so cities are not penalized by the state for under-producing housing due to a bad market." It could probably use some more black people, too. After all, this is the home of Frankie Beverly, whose music no black family reunion or festival is complete without. But the NIMBYism feedback loop between Lafayette, San Francisco, and the other Bay towns is making it tough for any black people to live in the region—unless they play for a championship NBA team. This story has been updated to include comment from Pedro Galvao at the Association of Bay Area Governments.